Zemdirbyste-Agriculture is a quarterly scientific journal which covers a wide range of topics in the field of agricultural sciences, agronomy. 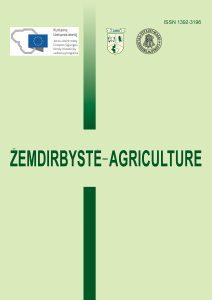 It publishes articles of original research findings in the English language in the field of agronomy (soil and crop management, crop production, plant protection, plant breeding and genetics, biotechnology, plant nutrition, agrochemistry, soil science, microbiology etc.) and related areas. Articles are peer-reviewed. Review, debating papers as well as those of a methodological nature will also be considered.